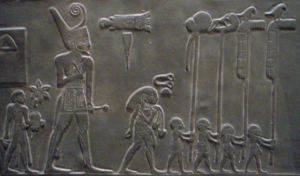 Ancient Egyptian floristry is one of the four types of historical floristry that make up the Classical Period of design style. It was discovered through wall and tomb decorations and artefacts mainly, that ancient Egyptians, particularly the Royals made extensive use out of flower, fruit and foliage arrangements styled in baskets and vases. They arranged and even cultivated roses, acacia, violets, poppies, violets, jasmine, Madonna lilies and narcissus, but one flower was held in the highest regard. The Lotus Blossom was considered sacred in ancient Egyptian culture, as they believed its yellow centre and white petals signified Ra, the Sun God. The Lotus Blossom was found mainly in ornate floral burial tributes and throughout art and paintings of the time. 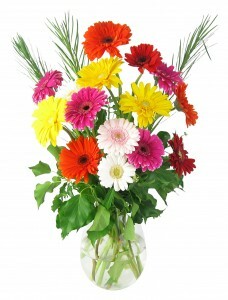 Characteristics of Egyptian floral design include using orderly, alternating patterns. The patterns were always highly stylised, simplistic and repetitious. The ancient Egyptians always placed flowers, foliage and fruits in spouted vases with no visible stems, or around the edge of the vase about two inches above the rim. Their flowers and foliage were always set in regimented rows, with every blossom flanked by leaves or buds on lower stems. The whole look was very put together and proper, with no bunching or overlapping of the material, and smart stem supports built into the top of the containers. The ancient Greeks used flowers and floral design in an entirely different way, and across all levels of their civilisation. 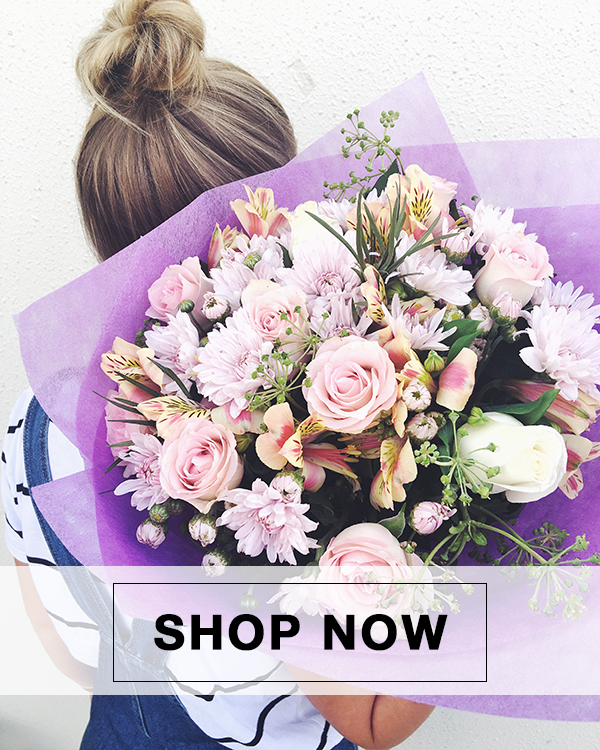 They were so dedicated to the beauty and heritage of their floristry that many Greek Period floral traditions exist today. Three linchpin designs from the Classical Greek Period of floristry are the garland, the wreath, and the Horn of Plenty or Cornucopia. Flowers were frequently and plentifully worn in ladies’ hair, and lovers exchanged small, perfumed wreaths to each other. Unique garlands and wreaths were presented as important religious tributes to Olympians and military heroes, too, but on festival days, everyone got to wear wreaths. In fact, the design and etiquette involved with the wearing of wreaths in ancient Greek society were so important that there were special officially designated designers, and a set of rules was even written. On the Greek Islands, different native herbs were included in the garlands and everyday floral arrangements. In Classical Greek design, the piece’s colour was never as important as the fragrance, type of flowers used and symbolism associated with them. 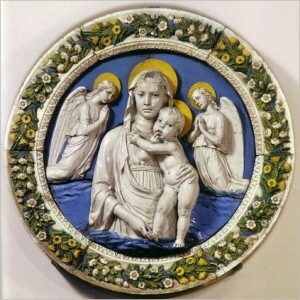 Often, particular arrangements were created to honour a god or hero. 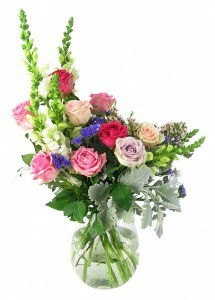 Classical Greek arrangements include flowers like hyacinths, honeysuckle, roses, lilies, tulips, larkspur and marigolds. Herbs that were frequently included were rosemary, flowering basil and thyme. 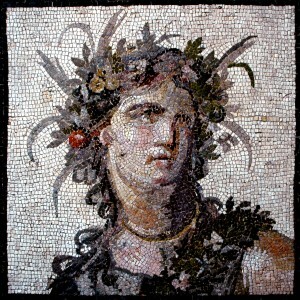 When the ancient Romans came onto the scene they took the free-spirited and abundant qualities of Greek floristry and infused their own regal, elaborate design aspects; best represented by the tapered olive crowns of the Roman emperors. Where the Greeks and Egyptians filled baskets with fruits and arrangements, the Ancient Romans used flowers – and lots of them. 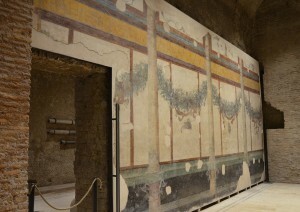 They also kept the Greeks’ garlands, wreaths and crowns, but changed the style up a bit. 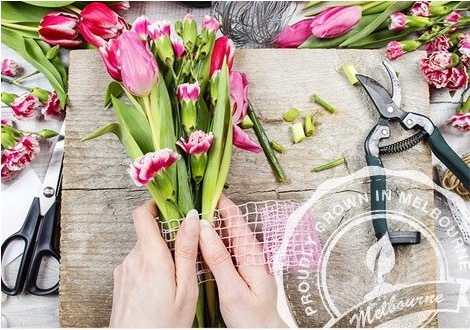 Wreaths, crowns and garlands made showier with the addition of new and exotic flowers like the crocus, oleander, myrtle, amaranth, ivy, narcissi and Laurel brought on by the extreme rise in trade. That same rise in trade brought with it the Egyptian style of using vases in floral arrangements, which the Romans took and adopted, naturally. 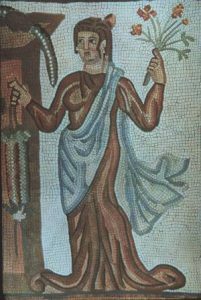 The art of floristry didn’t exactly evolve during the Classical Roman Period as the ancient Romans were concerned more with opulence and excess. That said, there were a couple of things the ancient Romans successfully added to our overall floral heritage and traditions: the tradition of “Dies Rosationis,” the tradition of placing roses on caskets in remembrance of those who’ve passed – these days continued by tossing single roses as well as rose sprays; and “Sub Rosa,” the Roman custom of hanging an all-white wreath of roses from the ceiling to signify everything said below will be kept secret. 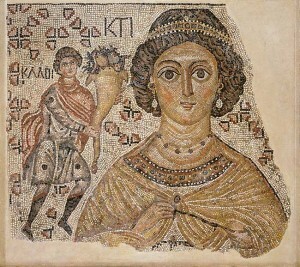 Byzantine Period floral design marks the final period in Classical floral design, but it goes out with a bang. The Byzantines picked up where the Romans left off, resulting in fantastic, symmetrical designs that made frequent use of elaborate containers with pointed bases and tree-like compositions that were actually exquisite floral design. If you compare the Byzantine style of floral design to what’s seen in the classic child’s fairy tale Alice in Wonderland, you wouldn’t be too far off. Enter the Middle Ages, a time where all we know about the art of floristry was mostly gleaned from large tapestries. It was a dark time and the only people who really practised floristry were European monks. The primary use of floral arrangements during this period was at churches in the forms of wreaths, garlands and vase arrangements. What we know about the styling we learned from Persian rugs, tapestries and art. 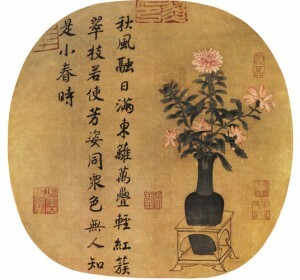 From this art we learned that flowers went back to being arranged in vases during the Middle Ages, and not just any vases, flowers were arranged in Chinese flasks. Other than the signs of Chinese influence in Middle Age floral design, we know little else about the designs of this period. 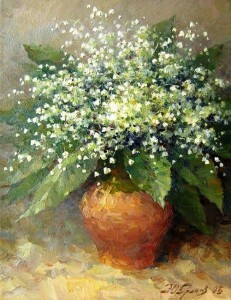 The floral arts didn’t die during the Middle Ages, more like it went into hibernation, preparing itself for the cultural explosion of the European Periods. As the monks in Europe tended to their gardens, they were also increasing the different types and cultures of flowers that would be used in floral design moving forward. 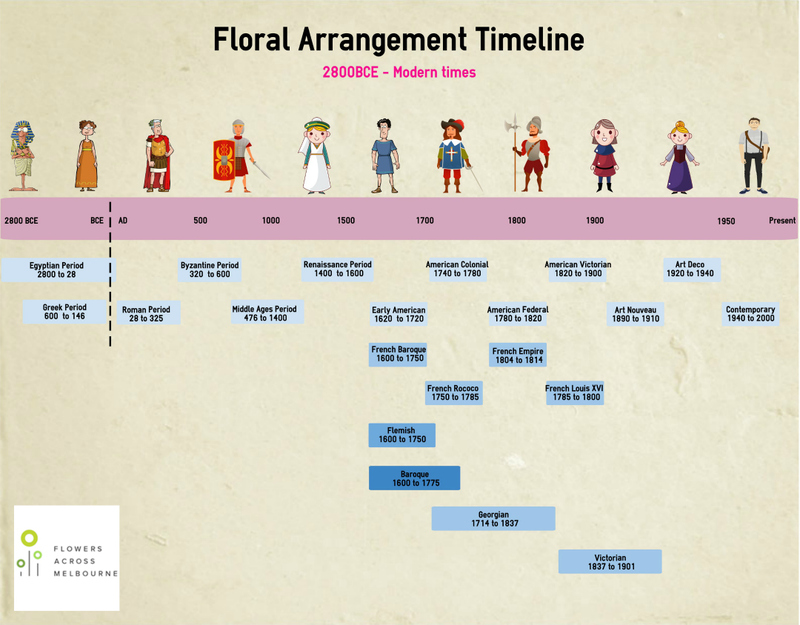 The Renaissance Period marks the beginning of the European Periods of floral design. The Renaissance style of floral design began in Italy, taking the classical Greek, Byzantine, and Roman styles as its basis and running with them. In classic Roman-style excess, people of the Renaissance Period enjoyed floral arrangements with large masses of flowers; they even hung long garlands of fruits, blossoms and leaves from the vaulted ceilings of cathedrals and on walls. Common flowers and foliage of the Renaissance Period include roses and Primroses, olive and ivy branches, daisies, lilies, Lily of the Valley, violets and laurel dianthus. Bright, contrasting colours in a triadic colour scheme were the fashion and arrangements were usually placed in huge, heavy containers. 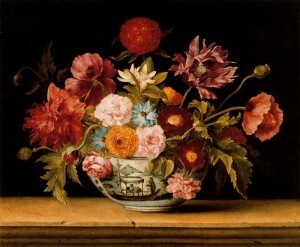 Despite all that, floral arrangements of the Renaissance Period still had an open and airy feel. In fact, many churches and large stage buildings still use Renaissance Period floral design as a basis for their own arrangements today. Another significant addition that the Renaissance Period gave to our floral heritage is the classic Christmas wreath popularised by the Renaissance painter Luca Della Robbia, made of fruit, flowers and cones. 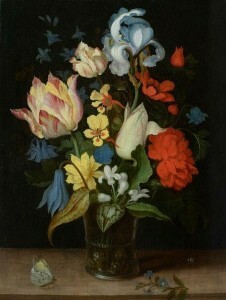 After the Renaissance Period, flower arranging as an art form had still not been officially established, thus, it was the painters who set the floral design styles. It was the Italian artist Michelangelo who took flower arranging and transitioned it into the Baroque Period. Most floral designs were tall and massive, using many flowers of an unrestrained colour palette, with the shape of the arrangements tending to be oval and symmetrical – perfect painting vignettes, no? The use of accessories like fans, birds and butterflies were also included to make for a full composition. Despite the aesthetic design liberties that were taken during this period, one significant new technique was developed: curved designs, specifically the C (curved) and S (Hogarth) shapes. The curved floral design takes an otherwise undefinable mass of flowers and transforms it into a more graceful and elegant appearance, giving more options to the designer in the process. As Michelangelo’s works and teachings travelled across Europe, they stuck particularly fast in Holland and Belgium (called Flanders). That’s when the Flemish style of art and floral design took hold and ran in parallel with the Baroque – when other masters like Homes began playing with the seeds Michelangelo planted. 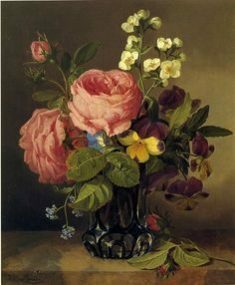 Particularly prominent in the Flemish style of floral design is the increase of an artist taking liberties; paintings used inconceivable curves and improbable floral stems, they often paired flowers together in pieces that would never be found in the natural world. 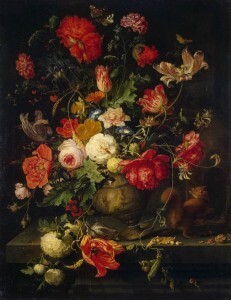 Flemish floral design used many more accessories, upping the ante with stuffed birds and nests with eggs. Still, despite Flemish floral designs being more massed, they were more compact with a better sense of proportion. Arrangements of these periods were large and flamboyant, including flowers like the iris, peony, marigold, hollyhock, and of course, the rose. 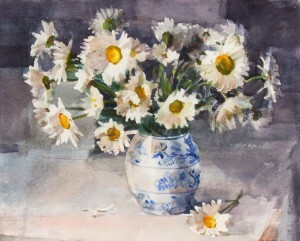 The Georgian Period of flower design is brief and distinctly English in that it was birthed from feudalism when, in the 15th and 16th Centuries, the collective fortresses in England gave way to smaller ruling homes. These houses had fresh flowers brought in every day for their fragrance, not their beauty. Because flower arrangements in the first half of this period were born of function, not form, many arrangements were nothing more than bunches of flowers crammed into whatever sturdy container, with no mind for design. 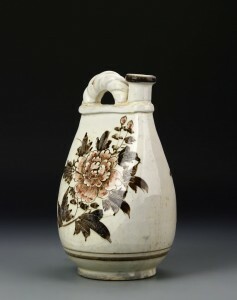 Flower containers from this period are mostly boxes with holes punched at certain angles to hold flower stems just so. Following the English vein of flower arrangement and design, the Victorian Era was named after Queen Victoria and marked by a period of design showcasing full elaborate arrangements. 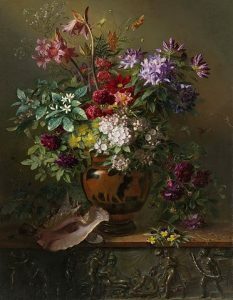 The upper class of society would frequently use flower arrangements to show off their wealth at parties, ordering excessive, opulent and overdone arrangements for their homes. 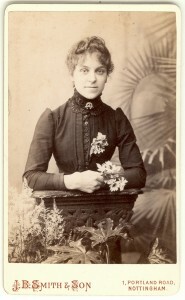 Victorian Era-flower arrangements were typically round or oval in shape, used lots of foliage, and kept their flowers restrained to a lower height. Victorian ladies preferred strong colour contrasts and brilliant hues. Victorian-era flower arrangements with fruit in them differed in that the fruit was added because it came from the same garden as the flowers. 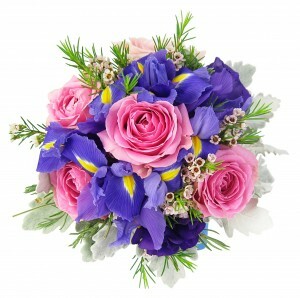 The Victorian Era was also the first time anyone tried to establish official floristry rules. It was a time of prim-and-proper society, with privileged ladies and their daughters cultivating and creating arrangements weekly, and tussie-mussie and nosegay bouquets becoming a necessity at every social gathering. Victorians also spoke the language of the flowers, giving single-flower bouquets to convey specific meanings, hearkening back to the Classical Greek period. 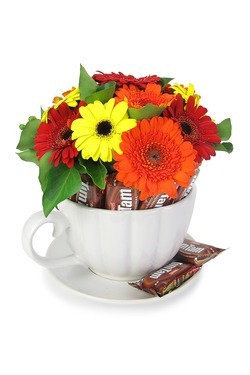 Gifts of chrysanthemum bouquets mean love while a red carnation means the feelings aren’t mutual. 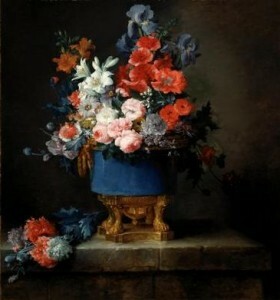 The French style of floral art was influenced not by painters, but by politicians. Specifically, politicians who wanted to show more feminine appeal via colour and size of the flowers used, but little thought was given to the design otherwise. The French Baroque period of floristry is marked by the introduction of the topiary and a symmetrical design style with no focal point. 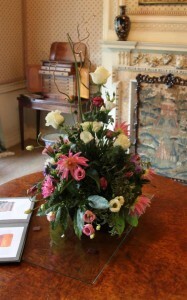 Floral designs and arrangements were more casual, fragile and delicate. 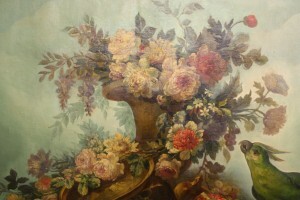 Floral designs of this time fit perfectly into a home with a French Country design style. Rococo means rock and shell and is a tribute to the period’s gentle arcs and graceful designs. The French Rococo Period is the invention of Antoinette Poisson, mistress of Louis XV, and was more formal, adding more feminine colours and airy design features. The arrangements of this period were predominantly crescent-shaped and designed to look open and light. During the short reign of Louis XVI, Marie Antoinette was able to further the feminine design trend of flower arranging, lessening the use of lavish containers and increasing the use of cooler colours like light purples, lavenders and whites, and more delicate flowers. This was right before the French Revolution and the revival of the heavier Classical Period that would follow. With the French Revolution came the Empire Period and a revival of the Classical Period. Nowhere was the influence greater than in France under the rule of Napoleon Bonaparte. 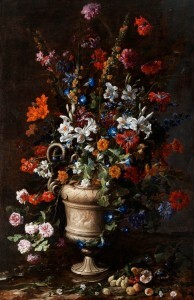 Flower arrangements of this period were strictly militaristic in theme and masculine in quality. Bonaparte ordered femininity to be dropped from the French design, resulting in Empire Period arrangements that were massive in size and weight and had large and garish symbols of the Empire, such as Napoleon’s trademark “N,” the bee, lion or Empire star. Arrangements of the Empire Period frequently had containers constructed to resemble lions and beehives, while the flower arrangements themselves were simple and triangular in shape. In the beginning, American floral design was birthed from necessity. Early colonists grew plants for food and medicinal purposes. 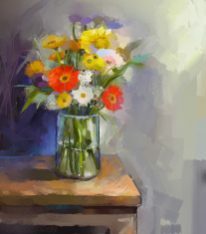 They didn’t have much spare time to play around with floristry, but when they did their arrangements were modest and simple, perfect complements to adorn their modest homes. Not surprisingly, flowers were used as decoration mainly in the central and southern colonial areas where the weather permitted. 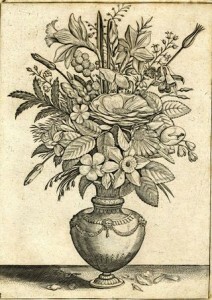 Floral designs of the time were copied mostly from the English Georgian and French Empire Periods. As the American Colonial Period began, flower design started to evolve, slowly. Mass arrangements were still assembled using a bunch of colours, but Colonial Williamsburg was best known for its flower arrangements in finger vases and flower bricks. The English and European roots of flower design began to take a deeper hold, with Americans favouring Georgian and French designs that they made more symmetrical and sophisticated. Triangular flower arrangements and fanned groupings at the top were preferred, sometimes stretching to three times the height of the container! This was a period in floral design that Americans began to break out of the mould and develop their own flower stylings. Overseas in Europe, the Neoclassic and Empire styles were popular and had a great influence on the American stylings. The result was American Period floral arrangements that used fewer masses of bouquets in favour of showcasing the charm of individual flowers. As a result, fewer flowers were used in containers and more attention was paid to the beauty of the arrangement. The American Victorian period coincided with the European Victorian period, with certain marked European techniques spilling over across the pond. Most noticeably, ornate containers made of different kinds of materials were used, often overflowing with flowers and the containers themselves were usually white or another cool colour. The arrangements themselves tended to be made in rich, royal purples, magentas, and deep dark blues. The Tuzzy-Muzzy enjoyed especial popularity, especially in the Deep South. American Contemporary flower design went through quite a few different stages, none lasting more than twenty years or so. The Art Nouveau Period from 1890 -1910 was known for arrangements that were based on curvilinear lines, often patterned after nature in the shape of plants and flowers. The containers that were used were carved and asymmetrical. The Art Deco Period took place in the 1920s and lasted until the 1930s. 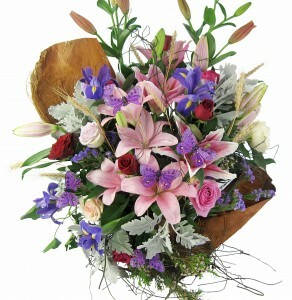 It was a style of floristry influenced by the Ancient Egyptians, jazz music, and the industrial age. Art Deco flower arrangements are characterised by the use of strong patterns and geometric lines. Corsages also became quite popular during this time. Like most good things, this style came back into popularity around the 1960s. Free Form Expression began in the 1950s and lasted until the 1960s. As America’s social scene and culture began to change arrangements changed with it, becoming more expressive with feelings, movement and freedom. Different design materials were used, and their textural differences highlighted, creating flower arrangements that looked more like art than nature. Geometric Mass Design took place during the 1960s and 1970s. During this time, tight, geometric bouquets were commonplace and arrangements started to combine mass with lines, resulting in rather stiff looking patterns and arrangements in compote containers. This style of floral design mimics the Oriental styles, in that clean-cut sculptural design is of utmost importance. The Chinese and Japanese had a much heavier influence on flower design in the Americas than the Europeans did. Not surprising when you consider that the Chinese have been making flower arrangements since as far back as 207 BCE! Chinese floral design during this period (the Han Period) was used as an integral component in religious teachings and medicine. Buddhists, Taoists and practitioners of Confucianism all traditionally placed cut flowers on their altars. However, since Buddhist teachings forbade the taking of lie, Buddhist monks would cut flowers and plants sparingly, using certain flowers and leaves to make basket arrangements based on particular symbolic meanings. Japanese floral design, called Ikebana, has been around since at least the 7th century, travelling with the Buddhists into the snowy mountains of Japan. Ikebana embraces minimalism, using a sparse amount of blooms spaced out between stalks and leaves. 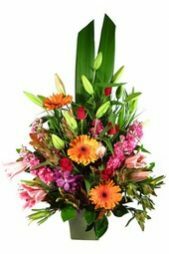 The structure of Japanese Ikebana floral arrangements is based on a scalene triangle, which many believe to symbolise heaven, earth and man. In other schools of thought, the scalene triangle is considered to represent the sun, moon and earth. Either way, twigs or branches usually delineate the triangle. Japanese flower containers are almost as important as the structure of the arrangement and were traditionally made from pottery. I was looking through some of your articles on this internet site and I think this site is rattling informative! Hello, what books did you use as references to make this timeline? Do you have a bibliography available? Feel free to email me with that information. We had to use a number of different sources both online and text form. Re The History of Floral Art what would the crafted/floristry/fusion type designs emerging throughout the WAFA affiliated clubs be categorized as today? “Contemporary” era just doesn’t seem appropriate.